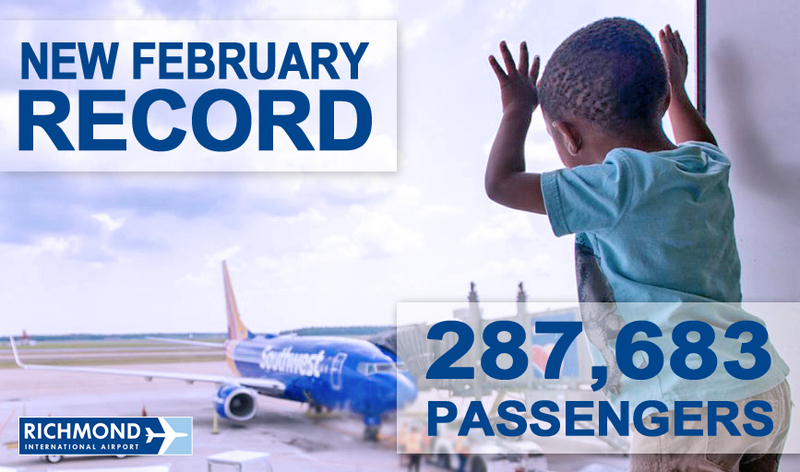 Richmond International Airport, VA (March 29, 2019 ) – For the 17th consecutive month, Richmond International Airport (RIC) reports a record level of travelers, as February’s total passenger count surpassed the previous record established a year ago. This year, RIC airlines reported 287,683 passengers versus 252,520 in February 2018 – a 13.9 percent increase. For February, Delta Air Lines was the market share leader for the month, with 30.9 percent of RIC’s passengers. American and United followed with 30.3 percent and 13.4 percent, respectively. New entrant Spirit claimed a passenger share of 5.0 percent. In February, all signatory carriers reported year-over-year growth, led by JetBlue (+15.9%), United (+14.7%), and American (+11.7%). With eight months complete, FY19 passenger traffic has increased 13.2 percent. Total cargo, measured as a sum of freight and mail, increased 0.2 percent from the same period a year ago to 10.21 million pounds. For the fiscal year to date, cargo tonnage is up 2.4 percent. Aircraft operations increased 7.3 percent in February, with general aviation (+12.9%) and air carrier (+11.7%) segments reporting year-over-year gains. For FY19, aircraft operations are up 4.0 percent. View the monthly aviation summary. Southwest Airlines will launch a new nonstop weekend route, Richmond-Tampa, and resume seasonal Saturday Richmond-Orlando service on August 10th. Allegiant will start new twice-weekly service to Sarasota-Bradenton International Airport (SRQ) on April 4th. SRQ will be Allegiant’s fourth destination from Richmond, joining St. Pete/Clearwater (PIE), Orlando/Sanford (SFB), and Nashville (BNA). Also starting in April, United Airlines will add a sixth daily frequency on the Richmond-Newark (EWR) route, increasing scheduled weekly RIC-EWR seats by 23 percent. Through February, fiscal year-to-date operating revenues totaled $34.2 million, greater than budget by $3.8 million, or 13 percent. Fiscal year to date operating expenses totaled $17.5 million, greater than budget by $66 thousand (less than one percent). 57.7 percent of the Commission’s year-to-date Capital Expenditures of $13.0 million have been fulfilled by SWaM or DBE businesses. For Goods & Services, the SWaM/DBE utilization rate has been 33.7 percent of Commission’s $2.9 million in spending. With Concessions, SWaM/DBE participation amounted to 18.0 percent of $2.0 million. To view SWaM and DBE reports, go here. Richmond International Airport (RIC) is one of the most modern airports in the eastern U.S. Seven major airlines offer nonstop flights to major domestic destinations and connecting options to points around the world. The activities of RIC and its tenants create nearly 16,000 jobs and contribute $2.1 billion in economic activity annually to the Richmond region, according to the Virginia Department of Aviation’s most recent economic impact analysis. In 2018, the Airport welcomed more than four million passengers. For more information, please visit flyrichmond.com. ← Interested in Doing Business with Car Rental Concessionaires? This Event Is for You!